Lisa Laporte highlights the importance of staying productive after your promotion. You may think that the work is over once you get your promotion, but the truth is that there’s still plenty to do and it’s important to keep your performance up. You’ll need to prove to people that you deserve the promotion and are up to fulfilling your new role. It’s time to work on adjusting to this role and the responsibilities it entails. Once the initial glamor of your new position wears off, it can feel a little overwhelming with everything new you’re taking on. 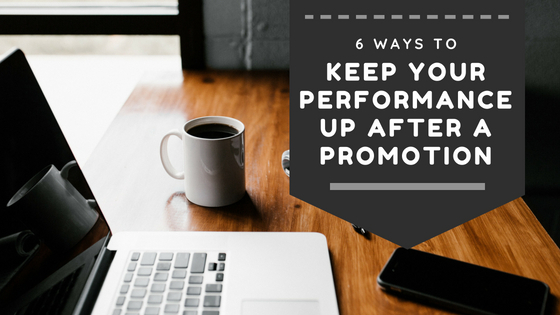 Here are tips for keeping your performance up after your promotion and pushing through the transition period. When you step into your new role, focus on the long term and make plans on how you’ll accomplish company goals in your position and where you want this experience to take you. You might feel overwhelmed in the moment, but focusing on the long term can help you center yourself and get through the initial stressful phrase. If you start to feel overwhelmed, it’s important to stay optimistic. You earned your new position and you’re certainly capable of doing what you need to do. Think of the ways you can excel in your new position and what a great opportunity it is for you. When you move into your new position, avoid taking on an entirely new persona and ordering people around. You need to command respect from people, especially those you’re now overseeing, but it’s also important to not become too demanding because you think you need to prove yourself. If you want to be taken seriously in your new position and keep your performance stellar, you need to remain professional. Even if it feels overwhelming, prioritize professionalism. If you’re in a new managerial role, you’ll also have to slightly adapt the way you interact with coworkers; stay professional at all times. While you should definitely stay connected to your former friends from work, it’s time to also work on getting to know your new colleagues. Take time to get to know the other managers or people in your new department. It might be comforting to stay within your old routine that was comfortable, but you should branch out as well. A big mistake people make once they take over a new role is trying to implement too much change. Generally, people do not like change. If there are new methods and ideas you want to implement, take it slow and get the input of your new team. Even if you see areas that need improvement, it’s important to foster positive relationships and start off on a positive note. Lisa Laporte's professional background spans over 30 years. She has worked in various industries and has extensive experience, particularly in sales and marketing. Lisa has worked many times to shape and grow startups, a business venture she loves. The challenge of working with fledging businesses to try to help them successfully develop their businesses to be financially and organizationally stable is incredibly rewarding to Lisa. In her 30s, Lisa Laporte became an entrepreneur by starting her own consulting business. Even though she enjoyed her professional career at the time, Lisa felt that it was time to make an effort at starting her own business. Using her large network of connections, Lisa was able to find plenty of clients for her consulting agency. Within the first year, the company was doing so well that Lisa was able to hire employees and worked with various companies throughout different industries. Eventually, Lisa Laporte moved on and became CEO for TWiT.tv and founded another company, Artisanal Agency, where she also serves as the CEO. Workin as the CEO of two separate companies simultaneously can be challenging, but it's a busyness that Lisa thrives upon. She's constantly working, but loves the creativity the companies require. When Lisa Laporte isn't at work, she's enjoying working on her photography, traveling, or spending time with her family.